Police in Myanmar’s troubled Rakhine state have opened fire on Buddhist protesters, killing at least seven. The violence occurred after more than 4,000 ethnic Rakhine Buddhists gathered in Mrauk U on Tuesday to protest at a ban on the annual commemoration of the fall of the ancient Arakan kingdom. Several injured people were also taken to hospital. Myanmar is home to scores of ethnic groups, some of which have come into armed conflict with the government. Mrauk U is the historic capital of the ancient kingdom of Arakan, and every year the local Rakhine population commemorates the conquest of that kingdom 200 years ago by Burmese forces. This year though authorities refused permission for the event to go ahead. A large crowd surrounded a government office in protest, and the police opened fire on them, causing multiple casualties. According to the local authorities, police initially fired rubber bullets to disperse protesters and used real ammunition only when demonstrators started throwing stones and bricks. This can only complicate the government’s efforts to address the wider conflict in Rakhine state, says the BBC’s South East Asia correspondent Jonathan Head. 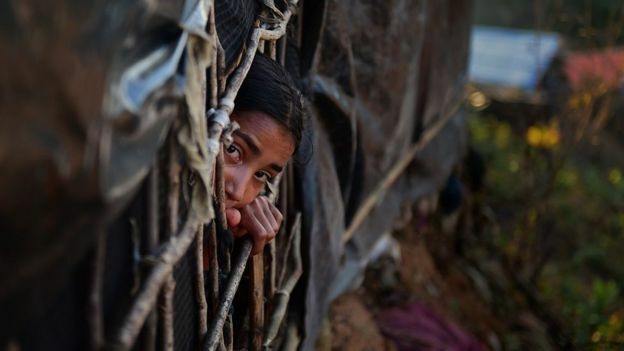 More than 650,000 members of a different ethnic group, the Muslim Rohingya, fled to neighbouring Bangladesh last year in the face of a military crackdown. Tuesday’s protests took place on the same day that Myanmar agreed with Bangladesh on a timeframe to repatriate the Rohingya. Communal tension between the Buddhist Rakhine population and Muslim Rohingya has risen sharply in recent years. Many Rakhine Buddhists joined the attacks on Rohingya villages, and their leaders are adamant that they will not accept the refugees back from Bangladesh, our correspondent says. The Buddhist Rakhine or Arakanese trace their history back to the Arakanese kingdom at the Bay of Bengal which was conquered by the Burmese in 1784. Ethnic minorities make up around 40% of the population of Myanmar, also known as Burma. Many have suffered persecution at the hands of the government, and some have built up separatist armies – armed conflicts continue between government troops and various ethnic groups, although ceasefires have been signed with others. Does an Indonesian who doesn't speak the language belong in the country?